What was the last commandment that Jesus gave his followers? It was this: "All authority in heaven and on earth has been given to me. Go therefore and make disciples of all nations, baptizing them in the name of the Father and of the Son and of the Holy Spirit, teaching them to observe all that I have commanded you; and behold, I am with you always, to the close of the age." Matthew 28:18-20. How Do You Go Forth and Make Disciples? In order to make disciples, you must first be a disciple of Jesus Christ. What exactly does that mean? Before you answer that question, consider what it means to be a disciple. Most believers identify themselves as "Christians." A disciple is a student, apprentice, or follower who emulates the example set by a master and seeks to identify with the master's teachings. To be a disciple involves a conscious and deliberate choice to surrender our own will and to follow Jesus Christ. Simon Peter had such a moment when, in response to an invitation, dropped his fishing nets, left everything, and followed Jesus. Luke 5:10-11. This is not easy to do. In response to a potential follower who first wanted to say farewell to his family, Jesus told him that "No one who puts his hand to the plough and looks back is fit for the kingdom of God." Luke 9:62. In today's culture, being a disciple of Jesus practically means that we apply the teaching of the Lord and His Church to every aspect of our lives. It means worshiping and loving the Blessed Trinity with all your heart, soul and mind, and loving your neighbor as yourself. Are you there yet? Most of us are not. ChristLife is a Three-Step Process to Facilitate Discipleship. Religious Experience. The faithful had never experienced "a personal encounter with Jesus Christ" that was profound and intense in the Catholic Church but had experienced this in other churches. The encounter resulted from a kerygmatic proclamation and the personal witness of the evangelizers that led to a personal conversion and to a thorough change of life. According to Pew research, only sixty percent (60%) of Catholics believe in a personal God. Twenty-nine percent (29%) said that God was an "impersonal force." Only forty-eight percent (48%) of Catholics were absolutely certain that they could have a personal relationship with God. Community Life. Catholics left for other religious groups because they were seeking Christian communities where they were accepted fraternally and felt valued and included in the church. Biblical and Doctrinal Formation. Catholics left seeking Biblical and doctrinal formation, not as theoretical or cold knowledge, but which brought about spiritual, personal and community growth. Missionary Commitment of the Entire Community. Catholics left due to lack of a missionary commitment to go out and meet those who are afar and on the periphery and to attract them once more to the Church and invite them to return to it. 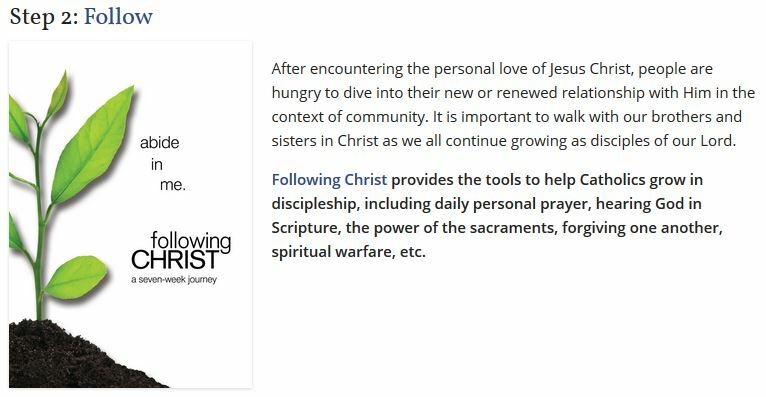 In Discovering Christ, we will explore what it means to have a personal encounter with Jesus Christ in a format that will foster a sense of community. There is no better way to get to know your fellow parishioners than by sharing a meal and sharing your own personal faith journey experiences in an intimate setting. In each of the courses, there will be teachings that will help to facilitate spiritual, personal and community growth. 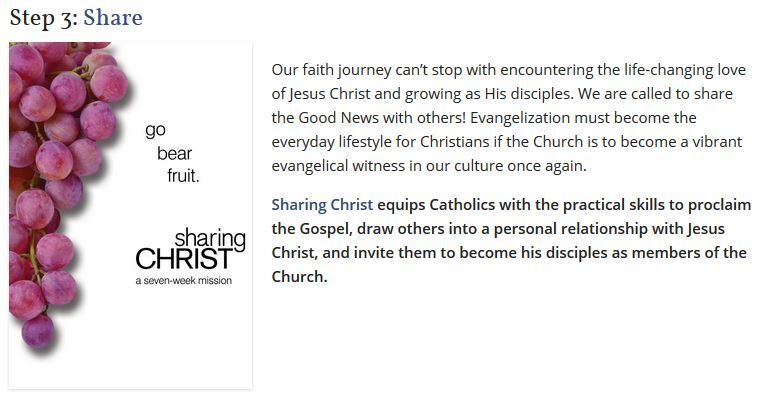 The ChristLife Series culminates with Sharing Christ, which will focus on practical ways to go forth and make disciples, thereby building a missionary commitment in our parish community. What is not believed or lived cannot be transmitted. . . . The Gospel can only be transmitted on the basis of "being" with Jesus and living with Jesus the experience of the Father, in the Spirit; and, in a corresponding way, of "feeling" compelled to proclaim and share what is lived as a good and something positive and beautiful. Lineamenta of the 2012 Synod Assembly, 12 (http://www.vatican.va/roman_curia/synod/documents/rc_synod_doc_20110202_lineamenta-xiii-assembly_en.html). Who Should Attend Discovering Christ? Everyone is welcome, Catholic and non-Catholic. You do not have to be a member of St. Francis of Assisi Catholic Church to attend. 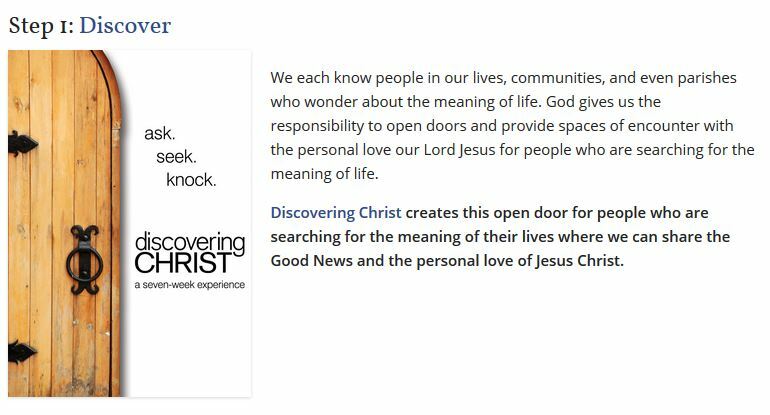 Our doors are open to anyone who is seeking a deeper and more personal relationship with Jesus Christ, or to anyone who wants to ponder the meaning of life.